I am special collections librarian responsible for rare books and liaison librarian to the Honors Tutorial College and other University honors programs. 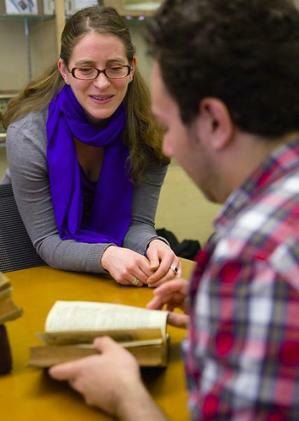 In my special collections librarian capacity I am responsible for managing any and all aspects of the rare book collection, ranging from collection development and donor relations to instruction and exhibit curation. I work closely with preservation and digitization to stabilize materials physically and to increase online access. I work with our social media coordinator to promote our collections on IG @aldenlibrary and on my own @miriamlibrarian. I often co-teach with my colleagues, the special collections librarian for manuscripts and the University archivist, as well as with other liaison librarians. We have a wonderfully active and collaborative instruction program, which translates into a very heavy and busy teaching load, particularly during fall semesters. We are also committed to community and k-12 outreach. Athens County and the surrounding region is one of the poorest in the country so we feel it is vitally important to provide the broadest possible access and to create diverse learning opportunities, including by bringing select materials to schools within a 2 or so hour radius. To give one current example, I’m working with a graduate student in music this semester who also teaches at the Athens Community Music School. He is planning a program for those students that he and other Ohio University students in the Music Teachers’ National Association collegiate chapter will lead using our musical manuscript leaves and early printed music leaves. This academic year I am also co-leading, with two faculty members, a faculty learning community on Teaching Book and Print History Across the Disciplines, which has been fun and very informative and inspiring. Like a lot of others who have written here, it was a convoluted path. I never planned or imagined that I’d be doing what I am today, but I couldn’t be happier about it. When I was in library school I became interested in museum librarianship and founded a new student organization, AMLISS, the Art and Museum Library and Information Student Society, to help meet the interests of other students like myself. I also worked as a research assistant at the Ackland Art Museum on campus, which I loved. I learned so much working with the registrar and with the educators, and was given the opportunity to curate my first exhibit entitled, surprise surprise: “The Art of Reading: Images of Booklovers.” After library school, despite applying for more than I care to remember, I did not get any job offers. I did, however, get multiple internships and decided to accept one in the Library & Museum Archives at MoMA. First, because, MoMA. But I’d also always wanted to live in NYC, where my mom grew up, and I thought if I didn’t do it then it might never happen. It turned out to be an incredible experience on multiple levels, not least because the Chief of MoMA’s Library & Museum Archives, Milan Hughston, knowing of my interest in World War II, introduced me to the then-director of the Leo Baeck Institute at the Center for Jewish History. As it happened their photo archivist was leaving at the end of the summer, coinciding with when my internship was ending. I loved living in the city so I applied, was hired, and ended up staying in NYC for eight years, during which time I started the PhD program at CUNY. I decided to pursue the PhD in history knowing that I loved being a librarian, had no interest in becoming a professor, and fully intended to continuing working as a librarian when I finished. I just loved the research and writing processes. At Leo Baeck I was responsible for managing all aspects of the photo collection, but I also worked at the reference desk in the reading room, and ended up working as collections registrar as well. These various roles gave me some experience with and insight into both archives and rare books, and I was always drawn more to the books. I left NYC in 2011 to complete my dissertation research and writing. As I was finishing that up and prior to my current position I worked part-time in reference at Monterey Peninsula College and part-time in reference and local history at the Pacific Grove Public Library where I was responsible for organizing and researching the historic book collection. By then I was hooked and almost could not believe it when I was hired to be fully responsible for a rare book collection, something I had never previously done. Now I can’t imagine doing anything else! My MSLS is from UNC Chapel Hill, my PhD in modern European history is from the Graduate Center, City University of New York. This is almost impossible to answer! I get excited or awed by something almost every day because I encounter new items in the collection almost every day. Recently I pulled a book by Helen Keller off the shelf and there was her name, beautifully printed, in her hand, on the first free endpaper. It gave me chills and I showed it to everyone who was around. We have a 13th century illuminated gothic bible and I could spend endless hours looking at the illuminations and the marginalia throughout. Also interesting is that it was previously owned by William Morris. After taking Todd Pattison’s fantastic Rare Book School class American Publishers’ Bindings I was thrilled to go into our collection and find our copy of Six Months in a Convent from 1835, still in its Benjamin Bradley stamped publishers’ binding. We have Edmund Blunden’s personal library, containing almost 10,000 volumes. He interacted heavily with his books, adding thoughts, corrections, questions, marginalia, doodles, sometimes including notes about where he bought the book and when, how much it cost, or who gave it to him. I also welcome the fact that he was not a wealthy collector, just someone who loved books and who rummaged tirelessly through used book stalls in London and elsewhere, happening upon treasures, and appreciating every book, modest or luxe, for what it had to offer. I of course love fine press productions and luxury bindings and the beauty of the book as a physical, even artistic, object, but one of my favorite things is to come upon people’s interventions in books, the signs of ownership and other personal traces that readers, collectors, and others leave behind and what those can tell us, and the questions they raise, about a book’s life and history. One favorite is in a bound volume of the 19th century periodical “The Household: Devoted to the Interests of the American Housewife” published in Brattleboro Vermont. A previous owner created tiny knitting samples and pinned them, with the sewing needle, onto the pages with the instructions they had followed to create the samples. I don’t really have the funds or space in my home to truly collect anything but I do buy the occasional affordable book that has an interesting or beautiful publishers’ binding, or that demonstrates some other important moment in or aspect of the history of the book, or that contains evidence of the particular book’s unique history and provenance. I also buy the very occasional artists’ book because I am absolutely fascinated by people’s creativity and ability to play with form, format, and structure in unexpected and sometimes provocative ways. I do of course have way more books than space for them. I prefer non-fiction and most of what I read, including for pleasure, are books about books and related technologies and the history of the book and of libraries. One thing I love about being in this field is knowing that there will always be more to learn. I want to learn as much as I possibly can and still feel like I’ve barely scratched the surface. Otherwise I’m usually reading food, travel, or garden essays. My husband would probably suggest I admit to collecting scarves and wooden spoons-the single greatest kitchen utensil-because I have entirely too many and can’t stop buying them. If plants count, I’m obsessed with bulbs and buy hundreds every year. Sadly, between our voracious squirrels and my lack of gardening expertise, relatively few of those grow or bloom. I love to be active and outside, as long as it isn’t too hot. Hiking, biking, and just going for long walks. Athens is in the southeastern corner of Ohio, very close to West Virginia, so we’re in the hills of Appalachia and it’s beautiful, rural, and full of good hiking. I moved here for this job five years ago and it’s a completely different world from anywhere else I’ve lived previously so it still feels new and I really enjoy exploring it. I swim a lot and try to do a few triathlons with open water swims and some runs every season even though running is miserable. Every year my husband and I spend more and more time gardening, just having a blast playing, experimenting, and learning as we go. I also love to bake, go on long road trips, travel, and spend time with my husband in his shop. He’s a woodworker who handcrafts amazing furniture. As someone who is not a maker at all, I find it very inspiring to be in any atmosphere of creation and artisanship, and we often finding fascinating connections between the tools and terms used in hand furniture-making and handpress book-making. See everything above and below! I learn and see something new virtually every day and that keeps me excited and motivated. I’m excited about working with new faculty, students, and departments, especially those in the sciences and other areas that are less traditional visitors to special collections. I find that faculty in different departments are getting more interested in the book as physical object which leads them to teach from more of a history of the book perspective and in more hands-on ways. There is a recognition that students respond better to active learning opportunities and that special collections provides a way to be creative with assignments and projects. Along those same lines there is a move toward teaching and learning techniques and processes. When students practice writing with a quill on parchment and experience how difficult it is, then come in and see a book or individual leaves written in that same fashion, but incredibly beautifully and expertly hundreds of years ago, there is a real impact. Most of all I feel we have a unique opportunity to offer students an interactive, immersive, learning experience that can engage all the senses and that enhances, content-wise, the rest of what they are learning. We need to continue to strive to always be more open, accessible, and inclusive. I think the field has made great strides especially over the past decade or so, but I see in my community that there is still a feeling of exclusivity around special collections that is off-putting, intimidating, or plain mysterious for many. To some extent that distance is inevitable because of the policies we need to have in place to protect and preserve our collections for the long term. So it is our responsibility to explain those policies and procedures in a way that is still welcoming and inviting. The conversations we are increasingly having in the field about also making our collections more inclusive and more representative of the communities in which we live are really inspiring and heartening. It is obvious that students become more engaged when they are able to connect, somehow, with the materials they see in front of them, and when they feel a sense of ownership of and relationship to the materials. One thing we’ve been doing is providing the opportunity for students who have heavily used our collections over the course of the semester to give their final presentations in our classroom, with the physical materials in front of them. We send out invitations and have a reception (in a separate room of course! ), and generally turn it into an event where the students are the experts on the materials and they are teaching others, including us, about what they have learned. It’s been incredibly mutually rewarding and it’s a program we’re looking to grow and expand. So many interesting things and as I said before, I’m always discovering new things! In our manuscripts collection we have the diary of the first woman to ever graduate from Ohio University. Margaret Boyd kept a tiny diary during her senior year, in 1873, and it’s incredibly moving to imagine her being here alone, the first, surrounded by men. The Lynn Johnson Collection contains over two million items from the work of that notable, and still very actively contributing, documentary photojournalist. Her work is extraordinary and so relevant to our daily lives. We historically had a strong focus on collecting artists’ books, an area of specialization that we have been returning to over the past few years. Maybe somewhat unusual is our Textbook Collection. It might sound boring but, covering many subject areas from the late 18th through the early 20th century, most of the textbooks show so much evidence of the students who once owned and used them that current students end up getting pretty interested. We also use them of course to illustrate how subjects were taught in the past and students are often blown away especially by the history and geography books. I’m really excited to be working with a doctoral candidate in creative writing this spring. As part of her dissertation she is creating three interactive installations for our library, which will be placed on three different floors. The title of the exhibit is “Beasts of the Interior by Sarah Minor: Creative Writing Off The Page,” which tells you a bit about her approach. Each piece incorporates text with visual, tactile, auditory, and other sensory components. To complement the notion of writing “off the page” we will be installing complementary displays, primarily of artists’ books as well as of some historic materials from the rare book and fine art collections, in cases near the installations. I’m thrilled to be exhibiting student work that speaks to and offers a different perspective into items in our collections. I hope this will help inspire other students both in their own creativity when thinking about narrative, form, and structure, and of course in thinking about special collections as a resource for their own work or personal interests. I think a goal most of us currently working in special collections have is to de-mystify the space and the materials. We want to be more welcoming, more diverse, more inclusive, and to create a range of opportunities for learning and teaching experiences that are hands-on and interactive. I also get really excited anytime students are teaching other students. Including student voices and perspectives in the work we are doing helps to demonstrate to other students that they can be a part of this world too. I find artists’ books are a huge help in this area because they are such fantastic conversation starters and they often speak to issues and topics that are relevant to students and their daily lives. Because they are often more immediately relate-able, I often use them in instruction as a door into rare books in the more traditional sense, meaning the old stuff. And I find that they usually pair beautifully and effectively. We’re also just starting work and conversations in preparation for various University and community events to celebrate the 100th anniversary of women’s suffrage. I’m fortunate to be working with a research apprentice, a student getting course credit to do research with me in rare books, who will be spending this semester identifying and researching relevant materials for possible inclusion in an exhibit we’ll have to honor that momentous decision. I am special collections librarian responsible for rare books and liaison librarian to the Honors Tutorial College and other University honors programs. In my special collections librarian capacity I am responsible for managing any and all aspects of the rare book collection, ranging from collection development and donor relations to instruction and exhibit curation. I work closely with preservation and digitization to stabilize materials physically and to increase online access. I work with our social media coordinator to promote our collections on IG @aldenlibrary and on my own @miriamlibrarian. I often co-teach with my colleagues, the special collections librarian for manuscripts and the University archivist, as well as with other liaison librarians. We have a wonderfully active and collaborative instruction program, which translates into a very heavy and busy teaching load, particularly during fall semesters. We are also committed to community and k-12 outreach. Athens County and the surrounding region is one of the poorest in the country so we feel it is vitally important to provide the broadest possible access and to create diverse learning opportunities, including by bringing select materials to schools within a 2 or so hour radius. To give one current example, I'm working with a graduate student in music this semester who also teaches at the Athens Community Music School. He is planning a program for those students that he and other Ohio University students in the Music Teachers' National Association collegiate chapter will lead using our musical manuscript leaves and early printed music leaves. This academic year I am also co-leading, with two faculty members, a faculty learning community on Teaching Book and Print History Across the Disciplines, which has been fun and very informative and inspiring. Like a lot of others who have written here, it was a convoluted path. I never planned or imagined that I'd be doing what I am today, but I couldn't be happier about it. When I was in library school I became interested in museum librarianship and founded a new student organization, AMLISS, the Art and Museum Library and Information Student Society, to help meet the interests of other students like myself. I also worked as a research assistant at the Ackland Art Museum on campus, which I loved. I learned so much working with the registrar and with the educators, and was given the opportunity to curate my first exhibit entitled, surprise surprise: "The Art of Reading: Images of Booklovers." After library school, despite applying for more than I care to remember, I did not get any job offers. I did, however, get multiple internships and decided to accept one in the Library & Museum Archives at MoMA. First, because, MoMA. But I'd also always wanted to live in NYC, where my mom grew up, and I thought if I didn't do it then it might never happen. It turned out to be an incredible experience on multiple levels, not least because the Chief of MoMA's Library & Museum Archives, Milan Hughston, knowing of my interest in World War II, introduced me to the then-director of the Leo Baeck Institute at the Center for Jewish History. As it happened their photo archivist was leaving at the end of the summer, coinciding with when my internship was ending. I loved living in the city so I applied, was hired, and ended up staying in NYC for eight years, during which time I started the PhD program at CUNY. I decided to pursue the PhD in history knowing that I loved being a librarian, had no interest in becoming a professor, and fully intended to continuing working as a librarian when I finished. I just loved the research and writing processes. At Leo Baeck I was responsible for managing all aspects of the photo collection, but I also worked at the reference desk in the reading room, and ended up working as collections registrar as well. These various roles gave me some experience with and insight into both archives and rare books, and I was always drawn more to the books. I left NYC in 2011 to complete my dissertation research and writing. As I was finishing that up and prior to my current position I worked part-time in reference at Monterey Peninsula College and part-time in reference and local history at the Pacific Grove Public Library where I was responsible for organizing and researching the historic book collection. By then I was hooked and almost could not believe it when I was hired to be fully responsible for a rare book collection, something I had never previously done. Now I can't imagine doing anything else! This is almost impossible to answer! I get excited or awed by something almost every day because I encounter new items in the collection almost every day. Recently I pulled a book by Helen Keller off the shelf and there was her name, beautifully printed, in her hand, on the first free endpaper. It gave me chills and I showed it to everyone who was around. We have a 13th century illuminated gothic bible and I could spend endless hours looking at the illuminations and the marginalia throughout. Also interesting is that it was previously owned by William Morris. After taking Todd Pattison's fantastic Rare Book School class American Publishers' Bindings I was thrilled to go into our collection and find our copy of Six Months in a Convent from 1835, still in its Benjamin Bradley stamped publishers' binding. We have Edmund Blunden's personal library, containing almost 10,000 volumes. He interacted heavily with his books, adding thoughts, corrections, questions, marginalia, doodles, sometimes including notes about where he bought the book and when, how much it cost, or who gave it to him. I also welcome the fact that he was not a wealthy collector, just someone who loved books and who rummaged tirelessly through used book stalls in London and elsewhere, happening upon treasures, and appreciating every book, modest or luxe, for what it had to offer. I of course love fine press productions and luxury bindings and the beauty of the book as a physical, even artistic, object, but one of my favorite things is to come upon people's interventions in books, the signs of ownership and other personal traces that readers, collectors, and others leave behind and what those can tell us, and the questions they raise, about a book's life and history. One favorite is in a bound volume of the 19th century periodical "The Household: Devoted to the Interests of the American Housewife" published in Brattleboro Vermont. A previous owner created tiny knitting samples and pinned them, with the sewing needle, onto the pages with the instructions they had followed to create the samples. I don't really have the funds or space in my home to truly collect anything but I do buy the occasional affordable book that has an interesting or beautiful publishers' binding, or that demonstrates some other important moment in or aspect of the history of the book, or that contains evidence of the particular book's unique history and provenance. I also buy the very occasional artists' book because I am absolutely fascinated by people's creativity and ability to play with form, format, and structure in unexpected and sometimes provocative ways. I do of course have way more books than space for them. I prefer non-fiction and most of what I read, including for pleasure, are books about books and related technologies and the history of the book and of libraries. One thing I love about being in this field is knowing that there will always be more to learn. I want to learn as much as I possibly can and still feel like I've barely scratched the surface. Otherwise I'm usually reading food, travel, or garden essays. My husband would probably suggest I admit to collecting scarves and wooden spoons-the single greatest kitchen utensil-because I have entirely too many and can't stop buying them. If plants count, I'm obsessed with bulbs and buy hundreds every year. Sadly, between our voracious squirrels and my lack of gardening expertise, relatively few of those grow or bloom. I love to be active and outside, as long as it isn't too hot. Hiking, biking, and just going for long walks. Athens is in the southeastern corner of Ohio, very close to West Virginia, so we're in the hills of Appalachia and it's beautiful, rural, and full of good hiking. I moved here for this job five years ago and it's a completely different world from anywhere else I've lived previously so it still feels new and I really enjoy exploring it. I swim a lot and try to do a few triathlons with open water swims and some runs every season even though running is miserable. Every year my husband and I spend more and more time gardening, just having a blast playing, experimenting, and learning as we go. I also love to bake, go on long road trips, travel, and spend time with my husband in his shop. He's a woodworker who handcrafts amazing furniture. As someone who is not a maker at all, I find it very inspiring to be in any atmosphere of creation and artisanship, and we often finding fascinating connections between the tools and terms used in hand furniture-making and handpress book-making. See everything above and below! I learn and see something new virtually every day and that keeps me excited and motivated. I'm excited about working with new faculty, students, and departments, especially those in the sciences and other areas that are less traditional visitors to special collections. I find that faculty in different departments are getting more interested in the book as physical object which leads them to teach from more of a history of the book perspective and in more hands-on ways. There is a recognition that students respond better to active learning opportunities and that special collections provides a way to be creative with assignments and projects. Along those same lines there is a move toward teaching and learning techniques and processes. When students practice writing with a quill on parchment and experience how difficult it is, then come in and see a book or individual leaves written in that same fashion, but incredibly beautifully and expertly hundreds of years ago, there is a real impact. Most of all I feel we have a unique opportunity to offer students an interactive, immersive, learning experience that can engage all the senses and that enhances, content-wise, the rest of what they are learning. We need to continue to strive to always be more open, accessible, and inclusive. I think the field has made great strides especially over the past decade or so, but I see in my community that there is still a feeling of exclusivity around special collections that is off-putting, intimidating, or plain mysterious for many. To some extent that distance is inevitable because of the policies we need to have in place to protect and preserve our collections for the long term. So it is our responsibility to explain those policies and procedures in a way that is still welcoming and inviting. The conversations we are increasingly having in the field about also making our collections more inclusive and more representative of the communities in which we live are really inspiring and heartening. It is obvious that students become more engaged when they are able to connect, somehow, with the materials they see in front of them, and when they feel a sense of ownership of and relationship to the materials. One thing we've been doing is providing the opportunity for students who have heavily used our collections over the course of the semester to give their final presentations in our classroom, with the physical materials in front of them. We send out invitations and have a reception (in a separate room of course! ), and generally turn it into an event where the students are the experts on the materials and they are teaching others, including us, about what they have learned. It's been incredibly mutually rewarding and it's a program we're looking to grow and expand. So many interesting things and as I said before, I'm always discovering new things! In our manuscripts collection we have the diary of the first woman to ever graduate from Ohio University. Margaret Boyd kept a tiny diary during her senior year, in 1873, and it's incredibly moving to imagine her being here alone, the first, surrounded by men. The Lynn Johnson Collection contains over two million items from the work of that notable, and still very actively contributing, documentary photojournalist. Her work is extraordinary and so relevant to our daily lives. We historically had a strong focus on collecting artists' books, an area of specialization that we have been returning to over the past few years. Maybe somewhat unusual is our Textbook Collection. It might sound boring but, covering many subject areas from the late 18th through the early 20th century, most of the textbooks show so much evidence of the students who once owned and used them that current students end up getting pretty interested. We also use them of course to illustrate how subjects were taught in the past and students are often blown away especially by the history and geography books. I'm really excited to be working with a doctoral candidate in creative writing this spring. As part of her dissertation she is creating three interactive installations for our library, which will be placed on three different floors. The title of the exhibit is "Beasts of the Interior by Sarah Minor: Creative Writing Off The Page," which tells you a bit about her approach. Each piece incorporates text with visual, tactile, auditory, and other sensory components. To complement the notion of writing "off the page" we will be installing complementary displays, primarily of artists' books as well as of some historic materials from the rare book and fine art collections, in cases near the installations. I'm thrilled to be exhibiting student work that speaks to and offers a different perspective into items in our collections. I hope this will help inspire other students both in their own creativity when thinking about narrative, form, and structure, and of course in thinking about special collections as a resource for their own work or personal interests. I think a goal most of us currently working in special collections have is to de-mystify the space and the materials. We want to be more welcoming, more diverse, more inclusive, and to create a range of opportunities for learning and teaching experiences that are hands-on and interactive. I also get really excited anytime students are teaching other students. Including student voices and perspectives in the work we are doing helps to demonstrate to other students that they can be a part of this world too. I find artists' books are a huge help in this area because they are such fantastic conversation starters and they often speak to issues and topics that are relevant to students and their daily lives. Because they are often more immediately relate-able, I often use them in instruction as a door into rare books in the more traditional sense, meaning the old stuff. And I find that they usually pair beautifully and effectively. We're also just starting work and conversations in preparation for various University and community events to celebrate the 100th anniversary of women's suffrage. I'm fortunate to be working with a research apprentice, a student getting course credit to do research with me in rare books, who will be spending this semester identifying and researching relevant materials for possible inclusion in an exhibit we'll have to honor that momentous decision.